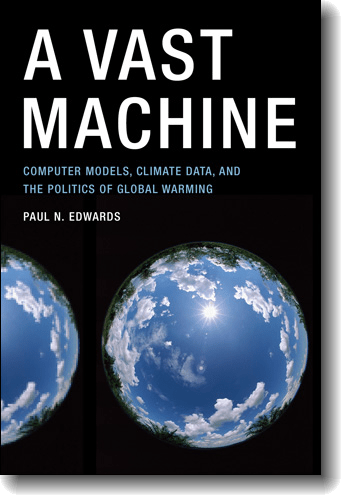 I’ve just ordered the book “A Vast Machine: Computer Models, Climate Data, and the Politics of Global Warming” by Paul Edwards. It’s out next month, and I’m looking forward to reading it. I found out about the book a couple of weeks ago, while idly browsing Paul’s website while on the phone with him. What I didn’t realise, until today, is that Spencer Weart’s wonderful account of the history of general circulation models (an absolute must read! ), which I’ve dipped into many times, is based originally on Paul’s work. Small world, huh?